Since I wanted to make these for my son, Isaac, who is almost 18 months old, I added my own sentiments to fit the images. I just handwrote them and stitched over the handwriting. 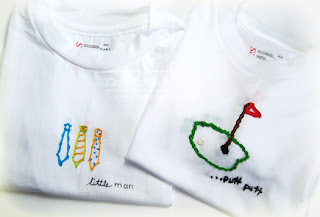 The golf shirt says "putt putt" (meant in more ways than one LOL), and the ties shirt says "little man", which is what I call Isaac all the time, "my little man." I think they'll be cute on him. . .kind of playful. After I finished all of the stitching, I decided I wanted to package them so I used a template I had purchased previously. 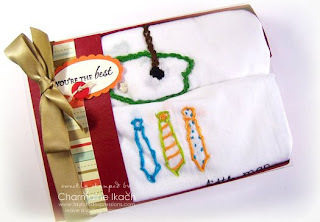 The paper is from the Father's Day Key Ingredients, as well as the ribbon and button. I used a partial sentiment from the Boys Will Be Boys set for the tag. I created an acetate sleeve to slide the box into so the shirts would be nice and secure. OH MY WOW!!! What a great idea - and you SO get a medal for embroidering! YOur creativity is so inspiring!! whoa, Charmaine! these are the cutest t-shits and great job on the embroidery! Oh my Charmaine, this is totally adorable!! Brilliant idea! You are soooooo clever and creative Charmaine!! LOVE this idea, and your embroidery is fantastic! !